It has been a busy week attending a work related conference, as well as the son's astrophysics PhD convocation (McGill). So, book blogging has taken a back seat. 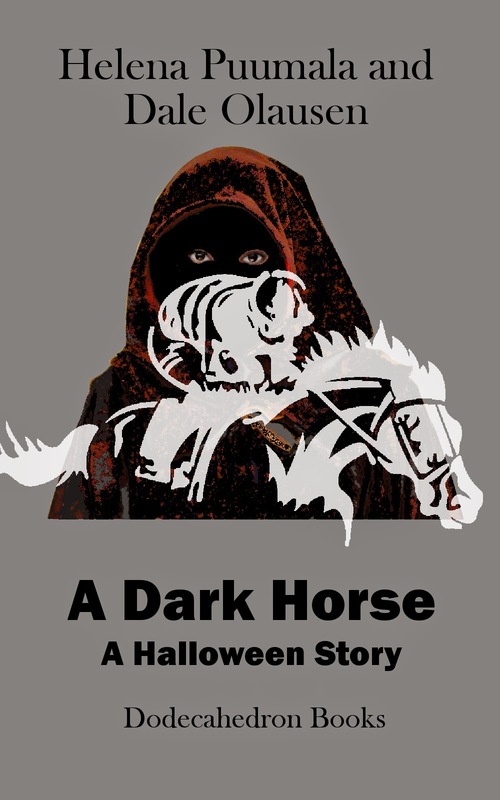 So, here is an old Halloween story I wrote during my horse-racing days (betting, not riding or owning), about a horse-player who may have sold his soul for a winning streak. Helena did some helpful editing (she knows a bit about the horse races too). It is a little bit Doctor Faustus,and a little bit Damon Runyon. By the way, Helena Puumala's Halloween story "Beyond the Blue Door" is doing nicely on Amazon this Halloween - in the top 10 or so for the "Ghosts and Haunted Houses" category and top 35 for Kindle Short Reads, Literature and Fiction. "No! Please! I'm begging you! Stop!" The woman's shrill voice reverberated down the long corridor. The young man hesitated and turned to his partner. The older man just nodded. The axe sliced through the air and met its target with a sickening thud. Weakly, the woman begged once more, then fell silent with the next swing of the axe. "She's tougher than I would have thought", the young man said with an embarrassed smile. "Keep going, a few more whacks ought to finish the job", replied the older man impassively. The young man warmed to his task. The axe rose and fell three more times. Suddenly the young man dropped the axe and bent over. "Dammit", he cursed. "Something flew up and went in my eye! I can't see a goddamn thing." "Serves you right", the woman said spitefully, "for destroying such a beautiful door. They don't make 'em out of solid maple like this no more, you know. If I asked you once, I asked you a dozen times, just wait half an hour and my husband will be home with the passkey. But would you listen? Of course not. Cops!" She spat the last word out, making no effort to hide her contempt for the men. "Maybe you guys better give me your badge numbers or something. Just 'cause you're cops don't give you the right to come in and damage honest people's private property, you know." The older man let out a long sigh. "I'll go through this one more time, Mrs. Donaldson. In fact, I'll go through it step by tiny step, just so there won't be any misunderstanding. My name is Captain MacNiel and this is Lieutenant Royker. We are police officers engaged in legitimate police business. The occupant of this apartment, one Mr. Daniel Foster, has been reported missing by his girlfriend. His employer says he hasn't been at work for nearly a week. We have therefore sought and received authorization from the court to search this unit and attempt to ascertain the whereabouts of said occupant. You've seen our search warrant. The owners of the building have been notified, and they'll be fully compensated by the City of Edmonton for any damage that's done. They can't blame you - it's entirely out of your hands. As for your husband - read the warrant. We are not obliged to waste all day waiting on him and his passkey. That's the way the law works, and if you don't like it, you're perfectly free to say so during the next election. Now would you please leave us alone to do our job!" "Yeah, sure", she replied as she walked back down the long corridor. "But you just wait 'till my husband gets back. He knows the law, you know. You won't be able to talk so tough once he gets back here." MacNiel shook his head and turned his attention back to the door. "It's alright, Royker", he said. "I don't think we'll be needing the axe anymore. I ought to be able to just get my hand through this hole that you've already made. You take it easy until we get into the apartment. Then we can attend to your eye." "I'm OK, Mack." With a wave he dismissed his partner's concern. "It was just a little splinter." Quickly he snaked his hand through the small opening and began to unlock the door. "Jesus, can you figure this? Three deadbolts on top of the regular lock. This Foster guy was some kind of a paranoiac." "Maybe for good reason", MacNiel replied. The officers stepped through the doorway, directly into the living room. The place was tidy, but not homey. It had the spare, utilitarian look typical of a bachelor's residence. Beyond the living room they could see a small kitchen and dining room; to their right was a hallway that led to the bedroom and bathroom. "Check out the bedroom and bathroom, Eric", MacNiel said to his partner. "And you'd better get on the horn to some forensic boys." MacNiel did a preliminary search of the kitchen and living room. Nothing suspicious, he thought. Certainly no signs of a struggle. He walked over to a large writing desk that dominated the living room. There were two empty glasses and an empty bottle of scotch resting upon it. Glen Fiddich, he thought. At least this Foster was no piker. Taking his hanky out of his pocket, he gingerly opened the desk drawers. The top drawers held the usual assortment of junk. Pens, pencils, stamps, unopened junk mail, receipts - nothing very interesting, at least not on the surface. The lower right hand drawer held some back issues of newspapers. That might contain some leads, he thought. The lower left held a sheaf of handwritten papers. He lifted the papers to look beneath them. His eyes opened wide with surprise. "Nothing terribly interesting in the bedroom or bathroom", Royker said as he returned to the living room. "Nothing? That's odd. That's very odd. I was expecting something quite terribly interesting." The younger man shrugged. "Just some back issues of The Daily Racing Form and a few skin magazines. Not exactly unusual items for a single guy to have. Mind if I close the window? Cold as death in here. You’d swear there was a damn blizzard outside." "Don't touch that window! ", MacNiel yelled suddenly. "Sorry, Eric - not 'till it’s been dusted for prints." MacNiel carefully removed the papers and placed them on the desk top. Then he gently slid the drawer closed, hiding its other contents. Royker walked over and stood beside him. Together, they examined the documents. It’s hard to know just where to begin. This whole situation is so confusing, so unreal that it’s got me shook up pretty bad. I'm only putting this down on paper to give myself a chance to really think things through. Maybe once I've done that I'll be able to get a decent night's sleep. Maybe that damn dream will quit coming back. Then I'll see how ridiculous, how fanciful this whole thing is. I'm sure it's just a bunch of coincidences, nothing that an intelligent person should get worked up over. I'll admit it - I'm a gambler. Fact is, I'm a degenerate gambler. If I wasn't, none of this would have ever happened. I know gambling isn't exactly the most wholesome activity going, but I can't help myself. I've always been attracted to it. Sometimes I think I must have been conceived at the racetrack, and knowing my old man, that's not entirely out of the question. It's in the blood, you know. Anyway, a while back, I was locked into the deepest losing streak I'd ever known, maybe the deepest losing streak anyone has ever known. At least that's how it seemed to me. I'd been six straight weeks without a winning day. Hell, at one point I'd went fifty-seven straight races without seeing the cashier's window. The odds against that must be astronomical. A dead man could do better. I mean, pure dumb luck ought to count for something. At any rate, I was feeling pretty desperate. Desperate is just a word. The truth is, I was terrified. The losing streak wasn't so bad - I had ridden out enough of them in the past. Nothing lasts forever - not in this world anyway. The thing with this one was, I'd gotten careless. I'd overextended myself with a bookie by the name of Black Mickey. I know it's bad news to fool with a bookie, but I'd ran out of chips, and figured my bad luck had to break sooner rather than later. I mean, this streak was getting old. It was due to end and the odds owed me a good score. Then there'd be plenty to go around, even after the bookie got his cut. Bookies - I'd always figured them to be a necessary evil, with heavy emphasis on the evil. I remember one time, when I was a teenager, my sister's boyfriend got every finger in his hand broken by some tough guys that his bookie had sent around. That was for a thousand bucks. I owed twenty gee's - God only knew what that would be worth to a guy like Black Mickey. Black Mickey. He wasn't Irish and he damn sure wasn't black. Anyone stupid enough to go in for a dramatic nickname like that just had to be dangerous. Everything was going wrong. Things were closing in. That's when the dreams began. The dreams - I'll try to describe them. They always began the same way. I can see myself lying in bed sleeping, tossing and kicking, as if I'm having a nightmare, maybe being chased by something. Suddenly I wake up with a start. I sit up in bed and stay real still for a while, as if I'm trying to hear voices in another room. Then, I get up and slip on my robe. The room's dark but it's not so dark that I can't move around easily enough. It's like maybe a full moon is shining. I open the door and walk down the hall into the dining room. That room's really bright, impossibly bright, way brighter than any light fixture could ever make it. There's a figure sitting at my writing desk. In the middle of the desk there's a bottle of Glen Fiddich and two empty glasses. I sit down across from the man. He pours us each a drink. I say man, but the word doesn't really fit. He's dressed very strangely, in something like a monk's habit. But this garment, it's made of some kind of cloth that I ain't ever seen outside of that dream. It's black, so black that it looks as if it's drinking up the light. If you've ever been caught after sunset walking down a deserted country road, when there's no moon or stars in the sky, you know what I mean. It was like all the light that fell on that gown was getting lost somewhere in the fabric and never finding its way back out. He's got a cloak covering his head. You can't see his face, because that weird cloth is soaking up all the light around it. Just the whites of his eyes can be seen, and in the center of them are pupils that are even blacker than his clothes. I try not to look at those eyes, but somehow I've gotta look, the way you can't help but stare at a someone who's been badly burnt when you walk by them. The first time I had the dream I could hear myself ask, "What is your name?". He didn't say a word, but even though I couldn't see his face, I had the feeling that he was smiling. "Yes, I do." I surprised myself by blurting out the answer so fast. "Your troubles seem very great to you, but they are inconsequential. I can help you, but you must realize that you have to return the favor." "Everyone has a price. You know what I mean." "Yes, I do." Again, I surprised myself. "Yes." I said it quietly, so quietly that the sound seemed to be too feeble cross the width of the desk. But of course it did. "It is done. The man you fear will no longer trouble you. We will drink to our arrangement." At that he raised his glass, and the scotch disappeared into the dark place where his mouth ought to have been. I drank my scotch in one throw, surprised at how smooth it was on my tongue. But it burned horribly on the way down. As I turned to go back to my bed, I heard him say 'Fateful Star'. Then I went back to my bed and fell into a deep sleep. There were no more dreams that night. The first morning after I'd had that dream, I woke up before dawn. I lay in bed thinking. I'm usually not much of one for recalling dreams but this one had such an uncanny feeling about it that I sort of lost my bearings. I remember having the crazy notion that the dream was a real memory. It was that authentic, like the memory of a car accident or a street fight, being played back in slow motion, with every detail vivid and in perfect focus. Eventually, these feelings wore off. The sun was up by then, and it made me feel kind of foolish. I must confess, though, that on my way to the shower I couldn't help but glance over at the table, half expecting to see two empty glasses at my writing desk. Well, now I'll be honest. I examined that table pretty carefully for stains from the glasses. It was that kind of a dream. As I left the building, at about noon, I was still feeling vaguely troubled, remembering that dream. My troubles suddenly became anything but vague. "Hey now, sonny-boy, don't you have a little debt to society that you'd like to come clean on?" It was an ugly voice that intruded. I turned to my left and saw a face that matched the voice perfectly. At the same time, a hand that would never need the assistance of a pair of vice grips squeezed my right shoulder. "You'd best answer the man", came an even uglier voice from an even uglier face. "He's an agent for a very important person." "Yeah, yeah, take it easy" was all I could manage through the sudden pain. The grip on my right shoulder let off a bit. "About that debt", the first voice continued, "our employer would hate to have to cancel your credit." "You'd better not disappoint us", the second voice added. "'Cause when the boss writes off a debt, he writes off more than just the debt." He increased the pressure on my shoulder for emphasis. "Get it, pal? He writes off more than just the debt!" The two men cackled like it was the best joke they'd heard all year. "Alright already. Tell Black Mickey that I'll have a payment for him tonight", I answered in desperation. I hoped they could hear me above the sudden pounding in my temples. I sure couldn't. "Alright", the first ugly voice said, "but no peanuts. Remember, we always know where we can find you." His partner gave my shoulder another squeeze for good measure. What a spot to be in. Money. I needed money. All of a sudden it wasn't hard to forget that dream, not hard at all. It wasn't hard to forget every book I'd ever read, every girl I'd ever known, every job I'd ever held. Even remembering my own mother's name posed a problem. The only thing that mattered was money. How much could I get and how soon could I get it. The only money I had left was a five thousand dollar bond that my grandmother had left me in her will, about four years back. I'd always prided myself on the fact that I hadn't yet gambled that money away. I'd always liked the old gal - respected her even. Even a degenerate gambler has feelings. If she'd have known what I was gonna use that money for it would have killed her. Good thing she was already dead, was all I could think. I hurried off to the bank. I needed that money in my pocket right now. I needed to see it, to touch it, to smell it. It was the only lifeline I had left. It was the kind of bond that paid good interest, but only if you could stick it out for the full five years. Seeing as how four years and change had passed the bank was only too pleased to see me cash it. What the hell. It was money. It would buy me time. That night's betting started off promisingly enough. The first three races were sucker bets, so I held off from any action until the fourth. That wasn't easy in my state of mind. But the fourth had a nice little filly running, one I'd seen a couple of times before. Lucky Steal she was called. She had good inside speed and by this time in the meet the track usually favored inside speed. To boot, she was coming off two solid wins against a field notable for its mediocrity. To my surprise, the crowd laid off her. By post time she was offering five to one. It was now or never. I wagered a grand on the nose. Lucky Steal, all right. Only, whoever was lucky, it sure as hell wasn't me. And the only stealing done was out of my wallet. I bet a cee on the fifth. It looked like a promising little exactor - So Friendly to Mister Buzz Wuzz. Naturally it came in Mister Buzz Wuzz to So Friendly and naturally it paid in the high nineties on a deuce. Naturally, I was too stupid to back up the bet. There went forty-five hundred, down the drain. The field in the sixth was garbage, so like a good trooper I held off. But it's tough to hold off for long when you're desperate. I was losing my confidence - I needed a win the way a baby needs its mother. A nice safe chalk bet. I figured that would be just the ticket. Rusty Sailor was favored in the seventh and he was good for anything a guy could scrape together. So I threw down five yards, even though he was only going off at three to five. Three hundred bucks wouldn't help the cause much, but I just had to have a trip to the cashier's window. A fourteen to one shot came in. By now my mood was getting black. I'd already gone though sixteen hundred bucks and my luck was worse than ever, impossible as that seemed. What would sixteen hundred be worth to Black Mickey? Probably a couple of busted fingers. That's all money meant now - so much hurt for so many dollars. Like I said, my mood was awfully black. As black as something you might see in your worst nightmare... Could it be? I scanned the form. Sure enough, there he was in the ninth race. A horse by the name of Fateful Star. The past performances were good and he'd ran some awfully fast times in recent workouts. Funny thing was, the morning line had him badly underrated. I approached the race with a kind of dreadful curiosity. I don't believe in all that supernatural mumbo-jumbo but I had to admit this was some kind of a weird coincidence. I kept a close eye on the tote board - his odds were incredible. Two minutes to race time and he was still better than ten to one. The way the crowd was laying off him, it was like they were reading from a different racing form. What the hell. He was too good to pass up, especially at those odds. I knew then that I had to pump him, dream or no dream, and I had to pump him big. I laid down three grand to win. The odds barely budged. I decided to go up to the grandstand to watch the race. This one was too important to see second hand on some lousy closed circuit TV. It was cold up there, so cold that most of the crowd had already gone inside. I hardly noticed it though - it felt like fifty thousand volts were going through me. I'd never bet this money much on a single race in my life and I'd never played for stakes this high. It was the moment that every gambler dreams about. If only I hadn't had that stupid dream. The race was a mile and a sixteenth and as soon as it had begun I knew I was sunk. Fateful Star - it all seemed like some kind of a cosmic joke now. He came out of the starting gate like he wasn't sure which way he ought to run. By the three quarter pole he must have been a good thirty five lengths back. All of a sudden, though, he went wide and seemed to catch fire. He hit the stretch like he was equipped with afterburners. He flew by the leaders and crossed the wire an easy three lengths ahead. Hell, he had so much speed to spare that the jockey couldn't restrain him 'til they'd circuited the track again. It was the damndest move I'd ever seen. I'm not usually one of these guys that gets emotional at the track. It always struck me as bad form to get exited in public over a win and even worse to get morose after a loss. In this case, though I suspended my rule. After all, I may very well have saved my neck or at least a couple of kneecaps. I just hope the poor dummy I wound up hugging half to death wasn't left thinking that I wear ladies underwear. I left the track a new man, a free man, a healthy man, and not incidentally a reasonably prosperous man. Things were definitely looking up. Even after paying off that leech, Black Mickey, I'd still be up a good six grand on the day. Grandma, you can rest easy again. I was feeling so high that the gravel road to Black Mickey's 'shop' in the country felt as smooth a mirrored glass. His strong armed thugs weren't going to have a nice soft body to beat on, after all. That was too bad. They'd just have to practice flexing their muscles on something else, like maybe a D-9 Cat. Once I'd got to Mickey's I was shown to his private office. He seemed surprised when I came up with the dough, although pleasantly so. In fact, he displayed a whole new aspect to his character. "You have the money, I see. Frankly I didn't expect it. I didn't realize that you were a man of such means. I must congratulate you. I'd assumed that you would have turned out to be just another deadbeat." He almost seemed sad to find out that he wasn't such a shrewd judge of character after all. "Come into my study. We'll have a drink together to celebrate your good fortune." I had to admit that his study was very nicely decorated. As crumbs go, he had taste. The walls were covered in finely crafted wood paneling, mahogany by the look of it. Two whole walls were reserved for books, all of which seemed to be exclusively confined to early editions, probably none less than a hundred years old. Not that that proved he could read. There were two hand stitched leather chairs, separated by an antique card table. The center of the room was dominated by a massive billiard table, very old world it seemed. It had obviously had a new cloth installed recently. It was a very bright red, almost blinding. Strange choice for such a room, I thought. "Have a seat", he said as he motioned me to one of the leather chairs. "Nice room", I told him. "Tastefully decked out." "Colloquially put, Mr. Foster, but I thank you just the same. Actually I rarely have guests in this room, unless I find them either quite promising or quite interesting." "Where do I fit in. I mean, why do I rate such a high honor?" I was in no mood to hide my sarcasm. "Interesting, I should think. Knowledgeable perhaps. Would you care to play a few hands of poker? You seem like the sort who enjoys a good bluff." "No thanks. I'm not sure that you'd provide adequate stimulation." "Very droll. Perhaps I should re-categorize you as promising. Billiards, then? Maybe you'd like to test your luck." "No, I think I'll pass on that one, too. I'd hate for you to wind up owing me money." All this phony refinement was beginning to get under my skin. "As you wish. Surely you'll join me in a drink though?" At that he walked over to a bar that was behind the pool table. I hadn't noticed it earlier. That garish red felt must have distracted my eyes. "Very fine scotch. Glen Fiddich. The finest available in these parts." He was beginning to swagger. "I'm impressed", I said with my most unimpressed voice. "So what is it that makes me so interesting?" "Merely that you managed to come up with such a substantial amount of money on such short notice. As I stated earlier, I'd expected you to be one of those who would need considerable persuading before you would you would have taken your debts seriously. Not that I mind - that part of my business is truly dreary. Let's just call my interest professional curiosity. How did you manage it?" "I'd rather not say. Professional discretion, you might call it. I don't like to disclose my sources." I took a drink of the scotch. Very smooth to the tongue but hot on the way down. I idly wondered what was familiar about it, then made the connection with an involuntary shudder. Just another stupid coincidence I thought. "Perhaps it was an inside tip? A reliable source that you'd prefer not to compromise? It might even have been a mutual acquaintance." He almost leered when he said that. "Maybe. Who knows? It could be something like that. Listen, it's been a pleasure doing business, but I've gotta go." I forced myself to remain calm as I tossed back the remainder of the scotch. "We have an interesting history, you and me. Perhaps we can make another mutually profitable arrangement sometime?" His choice of words was really beginning to make me jumpy. "You mean another loan? For another bet?" I said it quickly and sharply, definitely lacking the cool edge I'd come in with. "But of course", he said with a smile. "Whatever else could I mean?" "Maybe later. You can never tell", I said as I hurried out of the room. I had to get out that man's presence. I could barely talk now. My mouth was so dry that I felt like I could gulp down a river. As I left though, I couldn't help but look back. "You're real name can't be Black Mickey. What do your friends know you as?" "Alas, good business sense precludes me from divulging it to any but my closest associates. You understand, don't you?" The last sentence should have been a question, but to my ears it came as an accusation. "Yeah, sure. But why Black Mickey?" "Ah, well. One such as yourself, a gambler labelled me with that moniker. I believe the colloquial expression is, it stuck. But be patient, I'm quite sure that we'll eventually be on a first name basis." I couldn't be sure, but I think he smiled when he said that. That's the last time I've been to see Black Mickey. I've had no need of his services since then. My luck changed dramatically and all for the better. It's been the hottest winning streak I've ever had, for all I know it's been the hottest winning streak of all time. I don't know and at this point I really don't care. You see, this streak has been too much, to unreal for me to feel comfortable with. I like to win. Every gambler likes to win. Hell, everyone likes to win, gambler or not. But this thing - I don't know. I think I preferred the losing streak. The thing that's really got me are those damned dreams. Every night it's the same thing. They follow the script, the one I described before. I get up and go to the desk. The dark man refuses to tell me his name. We make a bargain, and we seal it with a drink. As I turn to leave, I hear the name of a horse. The next day that horse is on the card. If I bet the horse, he wins. If I don't bet he loses. I've made over $200,000 in the last month alone, and I'm not even trying. A horse player's dream, right? I'd give it all up for a good night's sleep. For a long while I thought I had it all figured out. Maybe I still do - who knows. Anyway, here's how I figured it. I've heard that everything that a person reads, hears, thinks, or otherwise experiences is stored permanently in some part of the brain. It's kind of like a complete record of your life, perfect down to the tiniest detail - only you can't usually get at it very well. A brain surgeon found out about it when he was poking around in some poor sap's head - you stimulate the right place, and bingo! The guy remembers a book he read when he was eight years old. Like any serious handicapper, I read the Bible - The Daily Racing Form, that is - studiously. That means buying the form for the next day’s racing as I'm leaving the track and poring over it that evening. My theory was that my subconscious mind was rereading the form and doing my handicapping for me. Then, in the dream it would let me have the next day's best pick. My mind probably chose the symbol of the dark man to convey the information because I was so rattled by Black Mickey and his henchmen when this whole thing started. As for all that stuff Black Mickey said about inside tips from a mutual acquaintance and getting to know his real name - it's all perfectly logical. As a big time bookie he must get lots of inside information about fixed races, from all sorts of people. It makes sense that when I won so big, he'd think I was doing the same – betting on a fixed race. And of course I'd eventually learn his real name - I'm a big time gambler and he's a big time bookie - what could be more natural than us eventually becoming 'close associates'. As for the scotch, that was just a coincidence. That theory seemed to explain it all nicely - until last night. The dream was different. The dark man didn't give me the name of a horse to play. Instead, he said that the next time I made a bet I would pick my own winner. But when I did, I would discover his name. Then it would be time for me to pay up. I don't mind saying that I was plenty spooked by that. As soon as I woke up I looked over today's card with a microscope. But try as I might, I couldn't find a horse whose name sounded in the least, well I'll say it, demonic. I guess I could have just skipped today's races altogether. That way there would have been no chance for the dark man's prediction to come true. But I couldn't let this superstitious nonsense get to me. I mean, hell, I'd be haunted, never making another bet for as long as I lived for fear of stumbling upon that name. I didn't bet tonight until the tenth race. By then I was getting awfully jumpy. I figured I had to take on a little action - it was the only thing that would release me from this crazy phobia. I carefully avoided looking at the horse's names. I just picked the most pathetic nag I could find. It was a little roan with absolutely hopeless past performances. She was a five-year old who still hadn't won a race. And she was up against a better than average field. Going on form, she didn't even belong in the race. To be doubly sure, I went down to the paddock and had a look at her. She didn't look like she could outrun a snail on valium. I figured I had a sure thing, dead last by at least fifty lengths. That would rid me of this mumbo-jumbo for good. The race was a carbon copy of the first one that the dark man had gave me. For the first half my horse was so far back it looked like she was gonna be lapped. But once she hit the three quarter pole, she took off like she'd been shot out of a cannon. She won by five lengths going away and didn't even slow down for a good half mile past the wire. When I looked up her name in the racing form, I couldn't figure it out for a while. Ellehcim de Roin, she was called. Kind of a stupid name, I thought, but then who knows with horses. It sounded French, but these weren't French words I was familiar with from my University days. Until you spelled them backwards - Michelle de Noir. Black Mickey. It was a bad joke, but it fit. So that's where it stands. It's 2:30 a.m. and I'm sitting in my apartment - just me and a bottle of Glen Fiddich, waiting for something to happen. Even after rereading what I've put down I'm not so sure what it all means. Probably nothing at all. There's a knock on the door. I don't want to go look. But it won't go away. This is crazy. I've gotta go – gotta fight this stupid phobia or it'll drive me mad. Nobody there. I must be hearing things - worrying for nothing. Probably it's just the booze. There it is again. Only it's not the door. It’s the window - it's someone rapping on my window. But...Oh my God, it's not humanly possible. I live on the sixteenth floor! "So Mack, how do you figure it? ", the young lieutenant asked. "I'm not sure, Eric", his partner replied. "Aw, come off it! You don't take any of this garbage seriously do you? I mean, a gambler selling his soul in a dream - a two hundred thousand dollar winning streak - a devil-bookie claiming his soul?". The young man gave an incredulous look. "I've been in this business a bit longer that you. There's more things in heaven and earth, Horatio..."
"No offence, Mack. I know you're Catholic and all that, but still." "I suppose you're right, Eric. How do you figure it?" "OK, I'll give you my theory. Maybe this guy was in trouble with a bookie. He can't pay him off, so he concocts this fantastic tale and splits town. He knows that once we read this thing and make our report, word will get out on the street. He figures maybe the bookie'll buy it and not bother to chase him to Montreal. Or wherever. End of story." "That could be. But there's a couple of loose ends. What about the locks?" "What about the locks? ", the younger man asked. "Seems to me, we had to break into this place with an axe because the door was locked from inside. One lock and three deadbolts as I recall. And obviously there's nobody in the apartment." Royker looked uncomfortable. He hated to have to acknowledge such an obvious flaw in his theory. "Well the window was open. A rope ladder maybe". "Sixteen floors. That's an pretty long rope ladder. And how did he unhook it from the window so's that we don't see it now?" The young man thought for a while. "Safecrackers got all kinds of devices - electromagnetic stuff that can open a lock from the wrong side. I suppose they can lock a door from the wrong side too. That's probably what he did." "Could be. The brass'll like that explanation better than devils. But there's one other loose end that I haven't told you about. And it's really hard to figure. If you can explain it, you've got me sold." The young detective felt he was on a roll. "Fire away, Mack." Slowly the older officer opened the desk drawer that had contained the papers that they had just read. The young man watched and couldn't help but let out a low whistle as he saw the neatly stacked bundles of hundred dollar bills. "He said he was up two hundred grand. I ain't counted it but I can tell it's one big pile of dough. So why didn't he pay off the bookie and go to Vegas with the rest?" "I don't know Mack. Maybe you and Shakespeare are right - maybe there are more things in heaven and earth." "You're learning. Like I said, I've been in this business a long time. Sometimes cases like this come up. Did you ever think of going to church, Eric?" The young man just smiled. "So how are we gonna file this one, Mack?" "It's just another missing persons case, son. Just another missing persons case."